CONSCIOUS, SUSTAINABLE, HIGH-END – We make conscious choices with our clients for a responsible way of building or renovating. Within the assignment we explore and reconsider the way we build and how we should treat our built surroundings in the most sustainable manner. In this way we achieve high-end projects with a responsible and positive impact on our environment. 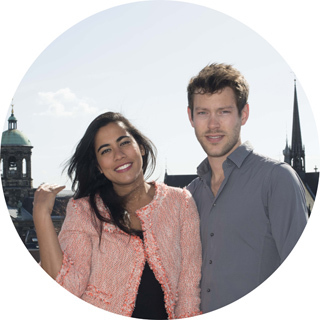 Let us introduce ourselves to you: we are two architects, Farah Agarwal and Arjen Aarnoudse. Together with our team, we form the architectural office 'The Way We Build’. We are young, ambitious and have a lot of experience. Farah grew up in Brazil and USA and has completed her studies in the Netherlands. We both graduated from the Academy of Architecture in Amsterdam and have a lot of experience within a number of renowned international architectural offices. What can we do for you? Because of the wide range of different work we have done so far, we have a broad-based experience in all levels of the design and building process. Through an intense collaboration with clients, carefully selected advisors and interested collaborators, we can be providing full architectural and interior design services for both public and private sectors. To meet us or for our availability and rates don't hesitate to contact us at details below.